Clare's Endowment is designed to ensure the College’s Financial sustainability and independence, now and for the future. 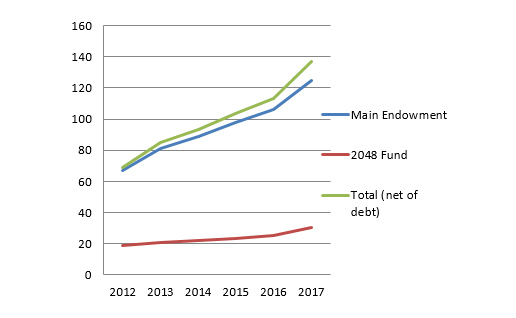 Compared with other Cambridge Colleges, Clare’s endowment fund - currently about £125 million - is mid-table. The College uses a long term spending rate of 3% of the average value of the endowment over the three previous financial years. This drawdown is used to support our core work: teaching, student bursaries, and the day-to-day maintenance of our historic buildings and grounds. 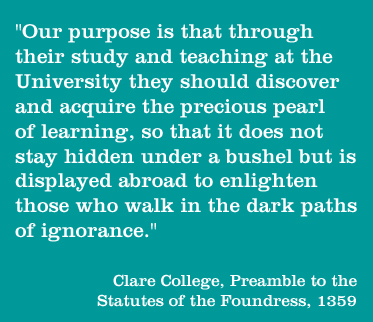 The endowment underpins life at Clare and safeguards the College’s existence for future generations of students, academics and researchers. As statutory support for higher education becomes increasingly uncertain, growing our endowment and, ultimately, becoming a financially self-sufficient institution is one of our highest priorities. If you would like to help secure a sustainable future for Clare, please consider donating to the endowment fund. To find out more about Clare's endowment and our plans for the longterm financial management of the College, please contact the Development Office.